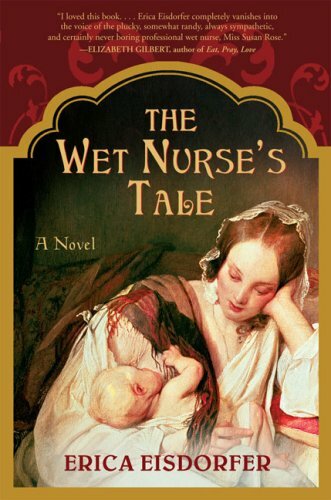 I heard about The Wet Nurse’s Tale by Erica Eisdorfer from Entertainment Weekly. Considering who recommended it, I thought it would be a poorly written tale about servants in Victorian England. Instead, it was a brilliantly written tale of servants in Victorian England. Susan Rose, our heroine, is a fat girl with bulbous breasts full of milk for the neglected babes of the upper classes. Like her mother before her, Susan is a wet nurse for rich English ladies who either cannot nurse their own babies or would rather not to “save their figures.” Each major section of the book is interspersed with the admissions of the families who sent their children to Susan’s mother. I have seen a peaceful expression turn to anger as fast as a whip cracks, and so the look on the face might mean less than what it seems to be. I take care of my things. After all, those of us as has few things to begin with must take care, lest we have fewer. If you’re servant enough, you can shrink into the shadows, even in the bright morning sun and even if you’re large enough to often block it. I love Susan Rose as a hero because she isn’t a weak woman. She may be fat, but she is strong. She toils in the laundry room, hiding her pregnancy, right until the day she delivers. She fights like a pit bull for her baby. She valiantly takes on a violent and mentally ill mistress in her home in an effort to save her own child. She one tough chick. I didn’t expect to be so fully sucked into the book. I started reading and within a day, I couldn’t pull myself away from it. I consumed the book in a marathon session of hiding under an afghan on my couch. I can’t wait for Erica’s second book! 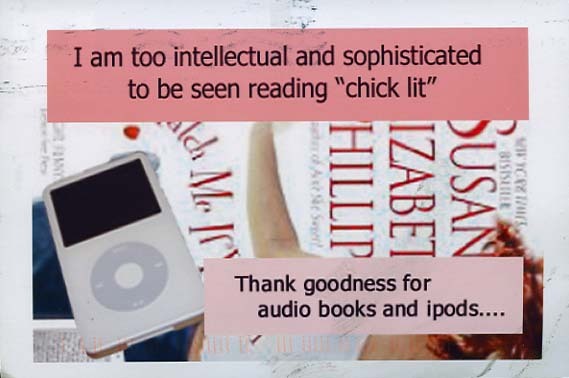 This postcard from PostSecret made me smile in recognition. Reading romance novels shamelessly is a feminist act. It’s celebrating literature written strictly FOR women. It’s the one genre that has been tailored specifically to women, even in a male-dominated society. I should rejoice in reading romance novels and release the shame I’ve felt all these years. I am so grateful that I’m not the only one who was hiding my book reading behind technology. Is all you need to be a successful fantasy author is a few extra initials in your name? I don’t think so, but it certainly helps. It seems that book publishers today ARE naming their authors in order to conveniently place them near another author on the shelf. For example, the large proliferation of authors with names VERY similar to Jane Austen in the Victorian romance genre. She doesn’t mention choosing a name to place your books near another, more famous, author. Nor does she suggest that adding a few initials to your pen name for your fantasy books might give you a little boost in sales. I think that in the future, when more book sales happen online instead of by people browsing through shelves of books at a bookstore, this fashion of using a pen name to strategically locate yourself near other authors won’t be as common. Amazon’s book recommendation features will indiscriminately recommend a book by Elizabeth Aston just as easily as one by Amanda Grange. Soon, pen names will be MORE like the Tolkien variety and less like the Elizabeth Aston variety. Or maybe, here’s a unique thought, authors will use their REAL names a little more often. I put it on a list and didn’t look at it again until I downloaded the Amazon Kindle application for my iPhone [iTunes Link]. 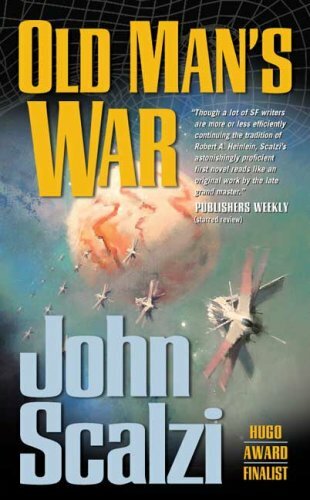 I went on a book buying spree for an entire month and the first book I bought and read on my iPhone was Old Man’s War. John Perry is 75 years old and nearing the end of his life. He and his wife volunteered for the Colonial Defense Force because they were promised a new body and the ability to live another life. Unfortunately, John’s wife died before she turned 75 years old. Now that John is ready to be enlisted, he leaves behind Earth forever to find the horrors of war and deep space. My marriage had its ups and downs like anyone’s, but when it came down to it, I knew it was solid. I miss that sort of security, and that sort of connection with someone. I didn’t mind getting old when I was young. It’s the being old now that’s getting to me. If the universe is bigger and stranger than I can imagine, it’s best to meet it with an empty bladder. Part of what makes us human is what we mean to other people, and what people mean to us. When you’re a teenager and you’re in love, it’s obvious to everyone but you and the person you’re in love with. When you lose someone you love, you die too, and you wait around for your body to catch up. Not since the last Bujold book with Miles Vorkosigan have I read a book with this much enjoyment and immersion. I loved John Perry and the themes of love and marriage that run throughout the book. It was absolutely wonderful! “Susan” at the What About Mom blog wrote a wonderful review of These Is My Words by Nancy Turner. One of my favorite things is to read books in the locations where they’re set. The only thing better than escaping into the world of a book is to escape mentally at the same time that physically you’re exploring to. I read Agatha Christie’s Death on the Nile while cruising down the Nile, Jane Austen in Bath, Willa Cather’s Song of the Lark while in a motorhome between Colorado and New York City, Elizabeth Peter’s Night Train to Memphis while not far from there (Egypt, not Tennessee), and Romeo and Juliet while sleeping in a 16th century palazzo-turned-youth-hostel in Verona. Someday I’d like to read Death in Kenya on the plains of the Rift Valley, and a Susan Napier romance while backpacking in New Zealand. This week I read These is My Words: the Diary of Sarah Agnes Prine 1881-1901, Arizona Territories (a novel) as we camped on the Utah-Arizona border with my parents. The idea of reading a book while at the location set in the book is new to me. I actually started reading Midnight in the Garden of Good and Evil when we were in Savannah, Georgia. Once the plane hit Utah soil, however, the half-read book went unfinished. In contrast, there are a lot of cities that I decided I wanted to visit BECAUSE of the fiction that I’ve read. And when time machines are easily accessible, there are FAR more epochs that I want to visit because of fiction. The beauty of books is that they can transport us to a different city and time without having to leave our comfy chairs.